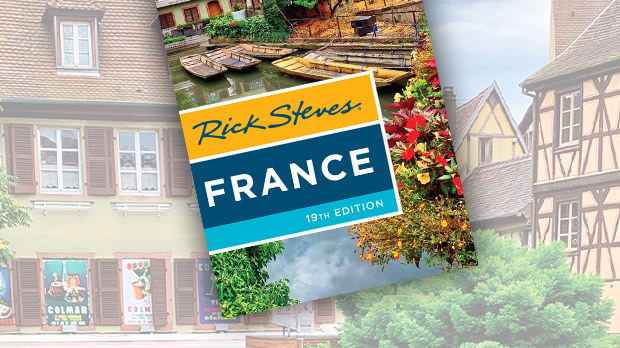 For a chance to experience the mystery of the medieval church through statues, glass, and relics, France's Chartres Cathedral, just an hour from Paris by train, is ideal. The towering Gothic cathedral, marking the center of the town of Chartres, somehow captures the spirit of the 13th century — the so-called Age of Faith — in the 21st century. In 876, the church — officially the Cathédrale Notre-Dame de Chartres, honoring "our lady of Chartres" — acquired the torn veil believed to have been worn by Mary when she gave birth to Jesus. The popularity of the Virgin Mary was huge back then, and Chartres, a small town of 10,000 with an extremely prized relic, found itself in the big time as a major stop on the pilgrim circuit. Then, in 1194, a fire destroyed the old church. The treasured veil was feared lost. But lo and behold, several days later, townspeople found the veil miraculously unharmed. Church officials and the townsfolk interpreted this as a sign that Mary wanted a new church. The people of Chartres worked like mad to erect this grand cathedral, gift-bearing pilgrims came as never before, and the church we see today was completed in 70 years. That's astonishing, considering that other Gothic cathedrals (such as Paris' Notre-Dame) took centuries to build. This remarkably speedy effort resulted in a much-appreciated unity of architecture, statuary, and stained glass — preserving a relative snapshot of the time. A fragment of Mary's venerated veil is still on display in the cathedral, kept in a gold frame — away from light and behind bulletproof glass. But today the cathedral is most famous for its stained glass and statues. Together, the glass and statues — created to inspire the illiterate medieval masses — tell the entire Christian story. In the "book of Chartres," as some have nicknamed the church, the text is the sculpture and windows, and its binding is the architecture. Gothic architects learned to create a skeleton of support with columns, pointed arches, and buttresses, so that the walls no longer needed to support the heavy stone ceiling but were free to hold windows. And with its vast nave — over 400 feet long and the widest in France — Chartres has plenty of room for windows. The cathedral contains the world's largest surviving collection of medieval stained glass, with more than 150 13th-century windows. The mystical light pouring through these windows encouraged meditation and prayer. While churchgoers in medieval times may have been illiterate, they were fluent in understanding the rich symbolism in the windows, and that filled their lives with hope. Medieval symbolism is more oblique to modern visitors, though, so I recommend the help of a good local guide to illuminate your visit. Historian Malcolm Miller has dedicated his life to studying the cathedral and teaching visitors its wonders. In high season, Malcolm and his understudy Anne-Marie Woods give excellent daily cathedral tours for a small price. As Malcolm explains, the windows on the cathedral's darker north side feature Old Testament themes — awaiting the light of Christ's arrival. And the windows on the brighter south side illustrate the good news of the New Testament. 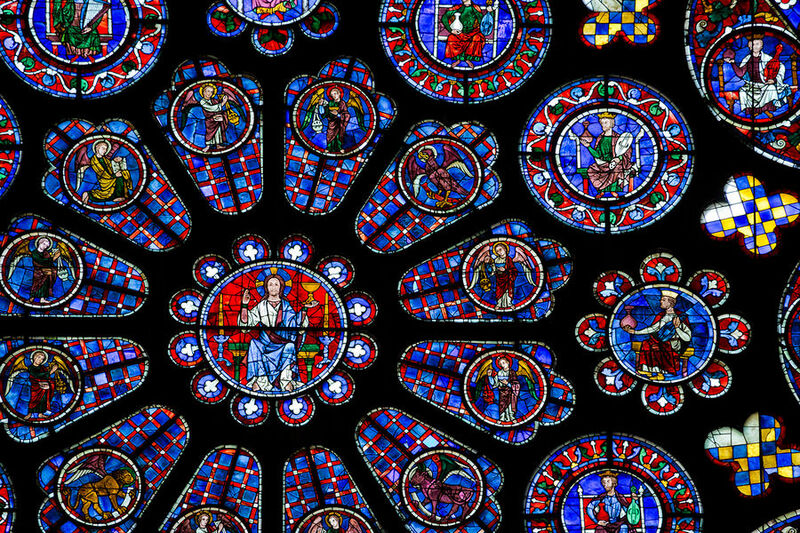 Read Chartres' windows in the medieval style: from bottom to top. A window near the entrance to the tower tells the story of Noah and the flood. In the bottom diamond, God tells Noah he'll destroy the earth. Subsequent panes show Noah building the ark, loading animals, waves covering the earth and drowning the wicked, and Noah releasing a dove. Near the top is a rainbow, symbolizing God's promise never to bring another flood. Outside, statues on the south porch show Christianity's triumphs over persecution. On the center door, Jesus raises his arm in blessing, while trampling a dragon and lion — symbols of evil — underfoot. Beneath Christ, the souls are judged, the righteous on one side, and the wicked, who are thrown into the fiery jaws of hell, on the other. A few years ago, I had some quality time all alone at dusk with Chartres' Gothic statues. The setting sun brought life to the expressions on their delicately carved faces. As I stood there, quiet and unrushed, it almost felt as though they were struggling to share with me the stories they've told eight centuries of pilgrims. It's a different experience once darkness falls. In the 13th and 14th centuries, Europe's wonderful Gothic church facades were boldly painted. 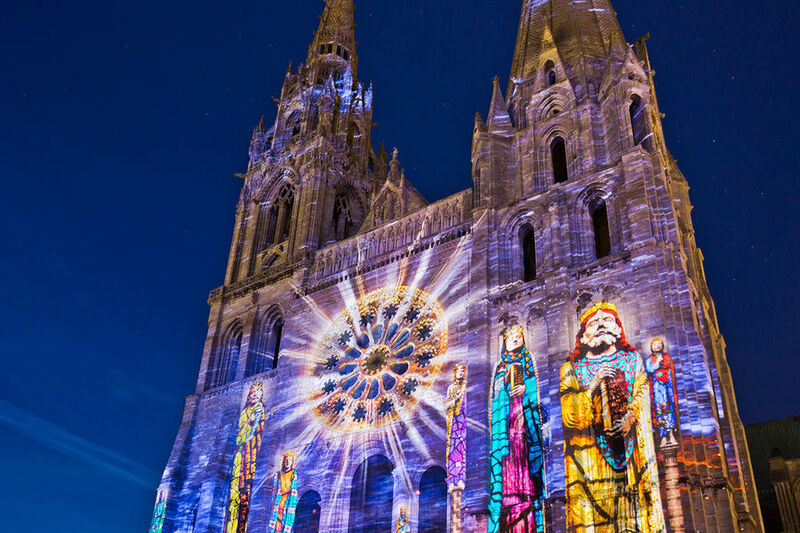 Chartres en Lumieres, a nighttime sound-and-light show (running April through September), helps re-create how the cathedral's facades might have looked with colorful statuary. A path of lights guides the way to two dozen "scenographies" all over town. Day or night, a pilgrimage to Chartres leaves me wonderstruck by its cathedral spires and stained glass — and awestruck by the devotion of its medieval faithful.